"Would you like wedding photography tips from an expert wedding photographer?" If you're going to shoot your first wedding, here are some expert wedding photo tips to help you make a positive impression at this wedding and every other wedding you’re going to be photographing. Learn everything from establishing a relationship and rapport with the bride and groom, to getting the best shots on the big day. Would You Like To Be A Wedding Photographer? 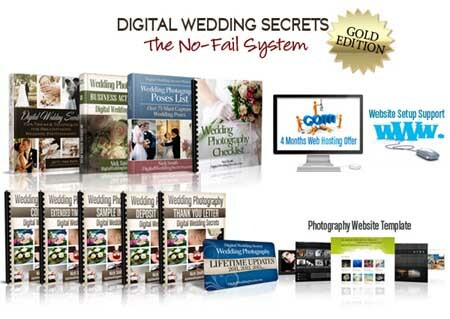 This great value all-in-one wedding photography business package by Nick Smith will get you started and earning real money quickly and easily. Contains everything you need to become a Pro with absolutely no risk! A - Always remember you are working, and act professionally. B – Be early. Get to the location where the bride will get dressed well before you need to be there so you have extra time to get the special "getting ready" photos. C – Cover all your bases by working with two cameras with different lenses. This could also save you embarrassment if one of your cameras quits working for some reason. D – Don’t drink when you’re photographing. Ever. Be professional, you’re there to do a job. 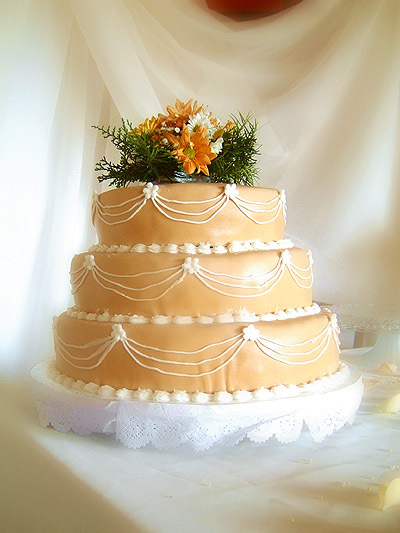 E – Explain your approach to the bride and groom so they know what to expect. Offer to show them some samples of your work. F – Form a relationship with the couple by shooting their engagement photos or doing a walk-through at the wedding location with them well in advance of the actual wedding day. G – Get lots and lots of photos. One of the best wedding photography tips. Better to have too many than not enough, and lots of variety is good. Even if the couple say they want all candid, be sure to get some posed shots and vice versa. H – Have an emergency contingency plan in case you get ill, in a car accident, have a death in the family, or some other unforeseen circumstance. Knowing other photographers who can cover for you in a crisis can be a life saver—and a career saver. 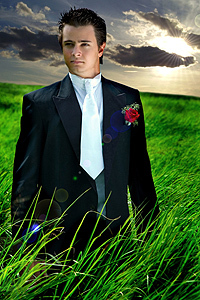 I – Inspect every photograph carefully before the bride and groom ever see it. Make sure you present only your absolute best work to clients. J – Jump up on steps, a balcony, a ladder, or whatever is handy to capture candids and formal portraits with new and fresh ideas and differentiate your photos from everyone else’s. K – Know your camera inside and out. As lighting conditions change between indoors and out and throughout the day and evening, you’ll need to make continual changes to your settings if you want to keep getting professional results. L – Lay out your gear the night before, pack the car ahead of time, and make sure you have adequate memory devices, lighting, battery packs or extension cords, extra bulbs, reflectors and diffusers, a back-up camera, fully charged batteries, extra batteries, all the lenses you will use, business cards, lens cleaning materials and fluid, a tripod or monopod, and anything else you will need. M – Make friends with everyone. Be friendly, chat as time allows, and enjoy yourself while you’re working. 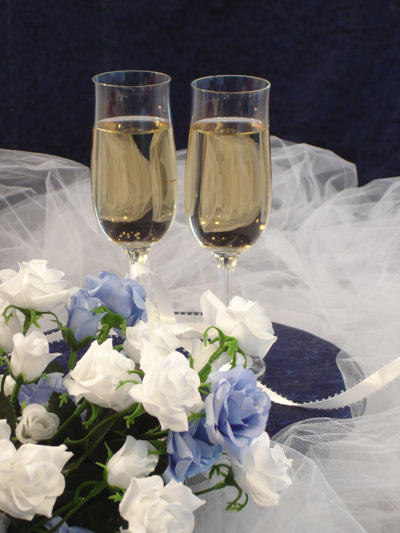 Just don’t forget you’re there exclusively for the bride and groom that day. N – Never over promise and under deliver. After the wedding, give yourself ample time to prepare the photos before you set up a time for the bride and groom to see them. If you cut yourself short, the quality of the work you show them will suffer and ruin your reputation. If you don’t keep your promises, you’ll ruin your reputation even faster. O – Over shoot rather than under shoot to be sure you get the shots you need. Memory devices are very reasonably priced these days and since you don’t have to develop every shot like in the old film days, you’ve got nothing to lose and lots of security to gain by shooting more photos rather than less. But don’t shoot a zillion shots of the same thing (i.e., a dozen shots of the back of the bride and groom as they stand before the altar) just because you have extra time to kill. P – Pose portraits carefully, paying attention to all the details. Adjust dresses and hair before taking the shot, check the lighting, and make sure you don’t have a tree, lamp post, or some other object "growing" out from someone’s head. Q – Quietly do your job, drawing as little attention to yourself as possible. Soon it will be like you’re almost invisible and you’ll be able to get some great shots as the bride and groom—and their guests—let their guards down. 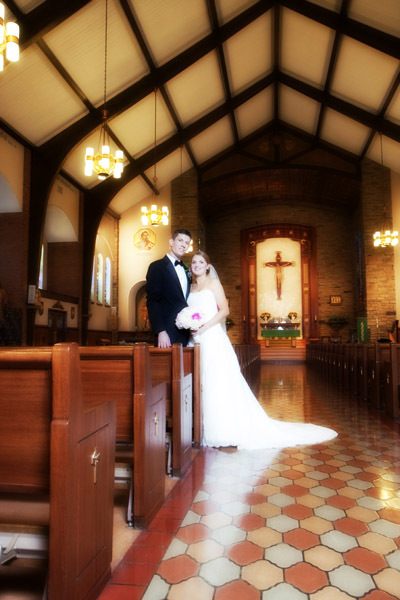 R – RAW is the best way to shoot weddings so you can make any adjustments after the day is done. This is one day you’ll never be able to recapture, so if you miss the shot or goof it up, having the RAW version you can tweak is the only chance you have to save it. S – Sit down with the bride and groom in advance to find out details about their family, the bridal party, and their preferred style of portraiture. 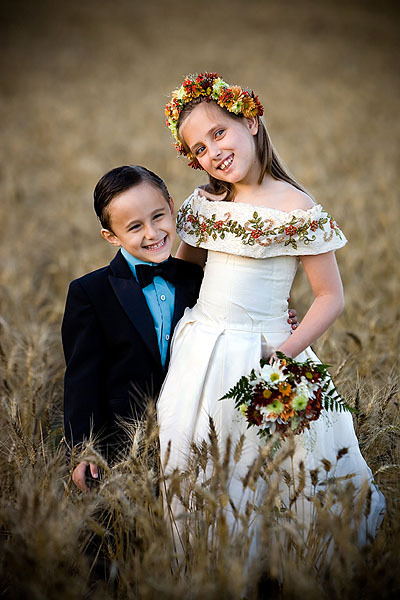 T – Touch up the bride and groom, with Photoshop elements or similar, on final photographs so you're always putting forth beautiful portraits—even if you don’t get paid extra for it. Your reputation is on the line every time someone looks at one of your photographs. U – Use people’s names when you talk with and direct them for photographs. It makes it much more personal. V – View this day as the most special day (at least so far) in the bride and groom’s life together and take every effort to make it meaningful for them and shoot the photos that will bring the magic alive again when they look at them. W – Work with a contract or written agreement that sets forth all the details—including who owns the photographs; how much money will be exchanged, when it's due and how it will be paid; and exactly what the bride and groom can expect for that fee. X – X-pect that there will be a few challenges during the day and resolve to take them in your stride. Whatever you do, don’t get short with Great Aunt Betty—even if she is trying to tell you how to do your job. Y – Your wardrobe should be neat, neutral, professional, and inconspicuous. You don’t want to stand out from the crowd. Z – Zoom in to get lots of candid shots from a distance where the bride, groom, and guests won’t even be aware that you’re photographing them. Read through magazines or books about wedding photography. Go down to your local bookstore and skim through as many wedding photography books as you can find. 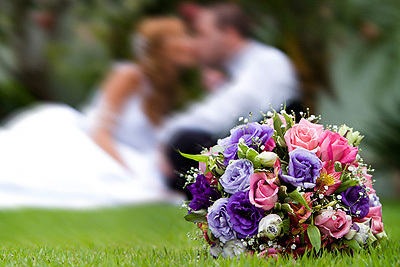 Gather as much information, advice and samples as you can from professional wedding photographers. Approach a wedding photographer that you know and ask if you can assist them at their next wedding. Tell them you don’t expect payment and are trying to gain experience. Bring your camera and take a few shots. They may come in useful. If you don’t know any professional wedding photographers, try joining your local photography club. It’s an easy way to meet new photographer friends. 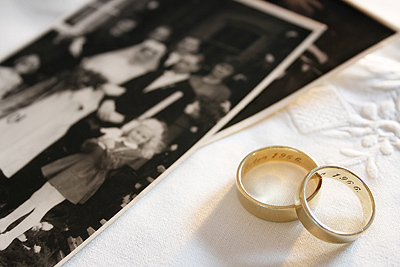 If you want to get hands-on training, try a wedding photography seminar hosted by Jim Kelley. 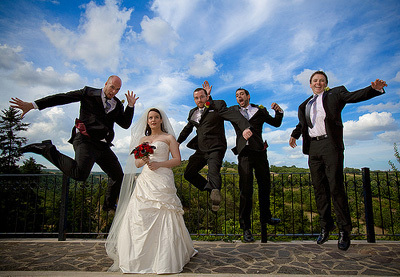 He can teach you the skills and techniques that are required to produce a great wedding photograph like the shot below. To find out more about this wedding photographer training seminar for beginners and the full money back guarantee if you're not satisfied, check out "Become A Wedding Photographer". Something else you might try is asking for help with your first professional wedding shoot. An assistant can help you keep track of your shot list, hold a reflector, organise people for shots, assist in composition and carry an extra camera for 'unexpected' candids. Checkout the venue you’re going to be shooting at beforehand. I personally like to go a couple of weeks before the wedding to look for good places to photograph the wedding party. If it’s a short notice wedding or a smaller wedding, I go to the venue at least one hour before I begin shooting. It gives me a chance to scope out the place. If it’s a wet day, I have a look inside to see if there’s anywhere to setup my lighting equipment. You need a good sized working area that is out of the way from other guests at the venue. Discover portrait photography tips that will give your portraits the wow factor. Learn to use the best lighting techniques and use the right props and locations to enhance your portrait poses. Fresh and new wedding photo ideas that will add a piece of creativity to your wedding portfolio. Use these wedding photography ideas to make your wedding photo album stand out. Discover these wedding photography lighting tips, techniques and the equipment you will need for indoor and outdoor wedding photography that will help you capture perfect shots of the big day. Digital wedding photography can be tricky, but there are some simple steps you can take to ensure that this most special of days is beautifully recorded.